This is a post from Peter Nunns. See Part 1 here and Part 2 here. In the first two posts in this series I introduced the postgraduate research project I’ve been working on, which looks at the causes and economic consequences of rising regional housing prices in New Zealand, and outlined the role of scarcity in driving house prices up, especially in Auckland. If housing was more abundant (and cheaper) in Auckland, would more people live here? Anecdotally, it seems like people are leaving – or staying away – due to the city’s housing crunch. To understand why people might want to stay in Auckland or move away, and to estimate what they might do if housing was more abundant, I used what economists call a ‘spatial equilibrium’ model. In effect, this is a systematic way of thinking about the impact of various ‘push’ and ‘pull’ factors. The first ‘pull’ factor is wages. All else equal, people prefer to live in more productive locations that offer them higher incomes. I used Census microdata to analyse variations in income for people who work in different places, controlling for their level of education, age, gender, ethnicity, etc. I found that Auckland and Wellington offer higher-than-average wages – perhaps a 5-10% wage premium over the national average – while rural places like Northland and Gisborne experience a substantial wage penalty of around 20%. This lines up nicely with the evidence on urban agglomeration economies. But regional wage differences are quite a bit smaller in New Zealand than, say, the US, where wages in San Francisco / Silicon Valley are around 50% higher than the national average. That suggests that New Zealand still has some room to agglomerate. The second ‘pull’ factor is natural and urban amenities. Some places are nice places to live, and so people are willing to earn a bit less or pay a bit more for housing to live there. This could be due to a warm, sunny climate, great beaches, access to regional parks, a beautiful urban environment, abundant entertainment options, etc. Measuring all of these factors directly would have been a pain in the neck, so I instead inferred which places were unusually nice by looking for places are attracting lots of people in spite of the fact that wages are low relative to house prices. On this measure, Auckland and Queenstown seem to have some of the best amenities in the country. The major ‘push’ factor is, obviously, the price and quality of housing. The house price data described in the previous post suggests that scarcity of housing has played a significant role in recent price increases, especially in Auckland. What if the ‘push’ from high house prices wasn’t quite as strong? The last piece of the spatial equilibrium puzzle is that people’s decisions about where to live are ‘sticky’. That is, we don’t always do what is economically ‘rational’. If people have family or cultural ties to a place, they may want to keep living there even if it strains their budget. However, New Zealanders obviously aren’t that sticky, as everyone here is either an immigrant, or descended from someone whose ancestors migrated here within the last millennium. So I tested various assumptions about stickiness. After developing this model, I used it to investigate alternative scenarios for recent house price increases. In effect, I looked at scenarios where housing was more abundant and in which we’d avoided scarcity-driven price increases over the last generation. In this scenario, house prices would have still risen – but at a much slower rate. The first finding was that people would move around quite a bit within New Zealand, generally to Auckland. I’ve illustrated that in the following diagram. Depending upon your choice of stickiness assumptions, this suggests that, rather than experiencing a slight outflow of New Zealanders, Auckland would have instead experienced an inflow of between 60,000 and 150,000 people from other regions since 2000. And, because Auckland is more productive than other regions, GDP would rise slightly as a result. However, inter-regional migration isn’t actually where the real action lies. At present, around one in seven New Zealanders works in Australia. From 2000 to 2016, I estimate that somewhere in the range of 120-130,000 working-aged New Zealanders moved to Australia. When I extended the model to include New Zealanders working in Australia, I found much larger effects on population distribution and economic performance. Depending on assumptions, making housing abundant throughout New Zealand would have reduced outflows to Australia by 50 to 100 percent. and socially as a result. This all sounds a bit pie-in-the-sky, and it is, a bit. We’re used to the current reality, which is that Auckland is growing rapidly and struggling to keep up on housing and transport. The idea that Auckland could add another 200,000 workers without severe problems seems unreal. But maybe we should rethink that assumption. I’ll give you some other figures to consider. To accommodate another 200,000 workers, Auckland would have needed to have built at least another 100,000 homes since 2000. From 2000 to 2016, Auckland actually consented around 125,000 new homes, which comes out to an average of just under 7,400 per annum. If the city had instead consented 13,000 per annum, year-in, year-out, it would have met this target. Going from 7,400 to 13,000 sounds challenging. But data published by Auckland Council’s Chief Economist Unit shows we’re currently tracking towards that figure. And future population growth projections suggest we will have to keep that up on an ongoing basis. Why not make an ongoing commitment to keep building until housing is abundant enough to meet everyone’s needs, and attract your kids back from Australia? It might just be good for us! Scenario 1: Reduce housing supply constraints in Auckland. This scenario is assumed to halve the growth in scarcity-driven price increases in Auckland. As a result, average Auckland region house prices would have risen to around $816,700, rather than the observed level of $999,000. Other regions would be unaffected. Scenario 2: Reduce housing supply constraints nationally. This scenario is assumed to prevent any further increase in housing scarcity over the 2000-2016 period. Average house prices would still increase due to increases in the value of buildings and increases in the hedonic value of land, but increases would be considerably lower. Scenario 3: Reduce house price distortions to zero. In this scenario, comprehensively overcoming housing scarcity in all New Zealand regions would result in a further reduction in price distortions over and above Scenario 2, although prices would still rise slightly relative to 2000 levels due to building improvements and the rising hedonic price of land. This is an ‘aspirational’ scenario that provides an upper bound on the economic gains that could be achieved by reducing house prices. This scenario has the largest economic impacts. NZ isn’t as physically large as the US. Driving all the way from Gisborne to Auckland takes a similar amount of time to driving from just outside of California to San Francisco. So it’s much easier for the rest of NZ to participate in, and reap the benefits of, our biggest cities. That may also reduce stickiness; if you can visit your home town to visit friends and family on a weekend then moving away from them isn’t so bad. New Zealand is longer than most people realise. I was looking at an map showing NZ laid over the top of USA this morning and with Invercargil near New Orleans the top of New Zealand reached all the way up to near the Canadian boarder. Families with school aged children don’t tend to pop back for the weekend as in my experience the weekends end up being very busy. When comparing NZ to USA you almost need to treat most states as separate countries particularly if you look at the West Coast rather than the East Coast which has states that are smaller in land area. Agreed except the entire population isn’t ‘families with school aged children’. I skimmed read and the bit that popped out for me was the quote “I still have friends in Auckland but most of the people I know who live there don’t have kids”. Having young children and wanting a better family life less time getting to and from work was why we moved from Auckland, not wanting to spend ages traveling to get together with friends. So I’m not surprised if it is a major motivating factor for other people to leave as well. We actually had a good sized section, with a home in good condition so it was the time spent getting to anything rather than cost of living that was the motivator for us as a family. The other thing is once you have children you spend less time with childless friends, so it was the perfect time for us to create a new network of friends in a new town. Yes having children isn’t the only reason why someone might choose to move away from Auckland but I also think if you want to feel settled in your new location and not feel like an outsider then you have to invest your time into making connections in your new home town. Provided the people who live here now and are paying for the infrastructure to be built get in first. The rights of returning New Zealanders is an awkward conversation no one wants to have. Given that all infrastructure is debt funded, those who come back are actually the ones who fund it. Most debt usually needs to be 1) serviced and 2) repaid. But please tell me how fuel and income taxes from people actually living here don’t do anything, and how ex-pats in the UK are actually funding everything. Here is an example where targeted rates could pay for a large chunk of commuter rail and light rail costs in Christchurch. Which means the new residents are paying for the infrastructure. To get the costs down even further the Urban Development Authority could take a voluntary land readjustment approach as much as possible. For example a land owner could be offered in exchange for adding amenities to their land -like rapid transit and building all the infrastructure needed to replot the land around said rapid transit -25% of the created plots (that are now much higher in value). 50% could go to unsubsidised yet affordable housing i.e KiwiBuild houses. 25% to a mix of subsidised rental housing i.e. State housing run by HNZ and unsubsidised rental residential and commercial property for the benefit of the rapid transit provider. Here is an article about land readjustment. To get the costs even further down and the revenues up for the transit provider(s). A Japanese commercial approach could be taken, as modelled by the early transit entrepreneurs. Ichizo Kobayashi (1873 -1957) was the founder of the present Hankyu Corporation and was one of the leading executives of the private railway industry in Japan. As an energetic innovative president, Kobayashi contributed to the progress of railway management as a service industry during the period when the urban private railways were taking shape after mainline railways came under ownership of the national government. As described in the main text, he promoted land development, department store operation, tourist site development, etc., in relation to the mainstay railway business, thereby creating a management style for Japanese urban private railways. His talent for writing (he once wished to be a novelist) as well as his skills in public relation and advertising, helped his appeal to the public. Among the variety of company businesses, a girl’s opera troupe, which attracted spectators along the railway lines, is uniquely recognised worldwide and still enjoys nationwide popularity. The company’s film and theatre division, which evolved from the opera troupe, is a major player in the industry in Japan. Kobayashi’s competence in corporate management bought him the position of president of Tokyo Electric Light Company, Japan’s largest electric utility, before WW11. He was also a government minister in 1940 and 1945. And then to ensure that rapid transit can compete on a level playing field with the automobile, urban space needs to be correctly priced. This includes congestion road pricing and car parking. I recently in a tweet thread stated that I am a Japanophile. Tokyo I believe is a practical example of the above approach to transport and housing. My article from the following tweet (that was in the tweet thread) went viral getting thousands of viewers on the 3rd of January. My article on Tokyo housing has always been my most viewed article. Japans rail and housing model is something NZ should be looking at very closely. Auckland Library holds a copy of Order Without Design – How Markets Shape Cities. I look forward to reading it, thanks Brendon. Good post, Peter – nice research summary! This is great research. The GDP effects that Peter modelled also do not measure the inequality effects of poor quality and inadequate quantity housing. So the full benefits to NZ society of having more a responsive housing market are even greater. I wonder how to model the effects of poor urban layout? For instance, the likes of Christchurch’s urban sprawl? Housing in Christchurch is relatively affordable compared to Auckland and Wellington but only at the expense of long car based commutes. Australia offers similar priced cities, but with much better transport links (by car or train) to much bigger labour markets. For example Brisbane houses are similar in price to Christchurch but the transport system and labour market is much, much better. So for Christchurch to attract kiwis back from Australia it would need to improve not just its housing market but also its transport system? Sorry but if you start with the wrong inputs, then you will get the right wrong answer. ‘inferred which places were unusually nice by looking for places are attracting lots of people in spite of the fact that wages are low relative to house prices. If it’s about total numbers, then 2/3rds of the population live out side of Auckland, so the greater amenity is regional/rural. Queenstown growth has been fueled from its expanding airport capacity, and the greatest tourism growth has been in the regions outside of Queenstown, with them using Queenstown as a gateway. That fact that wages are low to house prices is all to do with the fact house prices are high, not that wages are low. And the reason house prices are high is mainly to do with high land prices due to restrictive zoning. And this is a NZ wide issue. Most NZ regional towns are just another Auckland Cluster awaiting to happen, as soon as any influence happens and new comers absorb any existing below demand housing and land, they immediately run into the same restriction zoning rules that Auckland uses and prices increase. There is a huge outflow of companies from San Francisco/Silicon Valley and California in general to places like Silicon Prairie in Texas where companies can buy cheaper land, and their employees can buy truly affordable housing. Companies make more profit and the employees have more disposable income to spend on what ‘amenities’ are important to them, be it childrens education and/or holidays etc. We would do well to stop comparing ourselves to other jurisdictions that have the same problems we do, as in doing so at best only makes us look the best of a bad bunch, and secondly if they truly had the solutions to the problem you are trying to solve, then they wouldn’t have the problem to begin with. Why not look to those jurisdictions that do not have the problems re transport, housing affordability and disposable income. Germany, Texas and Japan all have far more valuable insights to offer than Aussie, Canada, California, and the UK. Yes there will be good reasons why some incomes haven’t risen. It could be that the employer is taking advantage, or they have spent so much extra on buying land/rent that it has effected their ability to pay decent wages, or maybe the job the person is in, does not value increased experience. But it is the land component, followed by the fees component that has risen substantially more than wages have fallen behind. There are some really good data that shows this. I don’t have it at hand, but should be easy enough to find, if you are inclined. Land input costs should be half of what they are at present, and bureaucracy of fees is tied to command and control of zoning, plus the fact we have such a low proactive legislative approach to development quality we have had to create a huge compliance reactive ambulance at the bottom of the cliff approach to try an mitigate some of the inevitable fall out. It’s interesting that you feel the need to disagree and argue when the research actually highlights the same issues that you do! On Auckland and amenity: Over one-third of New Zealanders live in Auckland, but Auckland region only comprises 2% of the country’s total land area. That’s an interesting pattern. @Peter Nunns that Auckland occupies 2% of the country’s total land area is only really informative if you also include how much of the total land area is built up, compared to farm land and uncultivated. I expect it is less than most would think. Your research would benefit from showing the value in crease in the raw land component vs construction costs from say 1985, as this would show the effect of land as the primary distortion. And I’m not disagreeing so much on what the effect is, ie high cost unaffordable housing with poor thermal performance, but on your interpretation of what the solution is. Can you please explain why “the Auckland Unitary Plan is one of the main reasons we continue to have these issues”? Are you suggesting there should be no restriction on hporizontal expansion of the city? I have no porblem with that as long as all restrictions on vertical expansion of the city. Then we can see what people really prefer. Right now we have a system where it is still easier to expand horizontally than vertically and so that is what happens. That distorts the market and can therefore also distort what type of housing people prfer to live in. If the only housing available is single family houses far from the centre, that is all people can buy. And even then it wouldn’t be an even playing field until all of people pay for all the externalities of their transport choices. There is a direct correlation between the value of land at the fringe and that going back into the CDB. Basically lower on the fringe, rising as you go closer to CBD. This ‘Slope’ is the same in all cities in the world whether the zoning is more, or less restrictive. The price for all is set at the fringe. if you restrict the fringe as the AUP does, then that land will become more expensive all the way in, relative to those that have less restrictions. As a basic principle, if you want to make housing cheaper in the center, make it cheaper on the fringe. And I 100% agree that this is significantly enhanced by allowing at the same time less vertical restrictions. Then, irrespective of the type of housing one may prefer, it will be cheaper. And for clarity, I am not saying ‘no restrictions’, but the ‘zoning’ has to be set up as a presumptive right to develop, rather than a presumptive right not to. The present AUP drip feeds land onto the market, which by default is a restriction. It also highlights the next land up for development and allows land-bankers to purchase and monopolize this land and controlling/limiting supply by default. What the AUP should do is put aside land for environmental reasons like wetlands, and likes Pukekohe protected soils, protected future transport corridors etc., but that is all, ie it does not need to designate zoning for residential zoning. What this will leave over is an abundance of the land still available for potential development, much of beyond the present immediate fringe which can be purchased as needed almost at the rural land price. This land does not need a change from its present zoning until it has been purchased for that reason by the developer. This abundance gives true extra immediate supply over demand. Research has shown that if you have in theory the potential amount of land available NOW for 30,000 houses, then this give minimum supply vent to allow raw land to to be bought at close to its next best use value, ie the rural land price. This 30,000 NOW amount is different to zoning 30,000 sections that will be developed at say 3,000 per annum over the next ten years. Presumptive right zoning would remove monopoly rentier ability of present land-bankers, and make fringe land a lot cheaper, resulting in all land, including land going into and including the CBD becoming cheaper. The savings on land cost can be returned to the purchaser in reduced prices and/or leaves more money available for developers to provide amenities, or to councils for infrastructure. This is how it is done in those jurisdictions that typically have housing of all types at 3x income to dwelling price. You seem to be ignorning the fact of infrastructure and services. What about the power supply, the stormwater, the sewers, freshwater, footpaths, roads, parks, schools, bus route and train lines? They don’t drop feed land release so much as coordinate infrastructure staging efficiently. Indeed that distorts the market. Unimproved farmland with no service and infrastructure isn’t worth very much, and a leveled section in a serviced and connected subdivision is worth tens to hundreds of times as much. What would open slather do except create disparate leapfrog development of homes on long driveways off rural metal roads without plumbing, power or schools? I do suppose that housing would be affordable but! Or we could just accept that we’ve sprawled too far, are paying the consequences of that through unhealthy commute times and unhealthy carbon emissions, water and air quality, and unhealthy public and social outcomes, and that as a society we are allowed to choose that we don’t want to sprawl anymore. Societies have always had choices and restrictions on behaviour. It’s part of what makes us human. There’s just no point in purposely providing something we don’t want – greenfields development – in order to try to enable the market to provide something we do want – affordable housing. There are too many other ways to achieve the latter without having to put up with the former. Insisting that it is the only way is just ideological. Regulations, and the free market, are both tools we can choose to use where and when we want. We need to retain as much biodiversity and green infrastructure as we can for future generations.We need to provide a compact city form so that public transport works more efficiently and we can waste as little money as possible on infrastructure, by sharing it. We need to make sure as many people as possible can live in good proximity to the things they want to do, not have long, marriage-breaking commutes or miserable, isolated teenage years. We need to provide more transport choice instead of consigning people to the car dependency that sprawl requires. If you want to advocate to free up space for housing, the place to start is the at-grade carparks. Of course I haven’t ignored infrastructure, having both developed in NZ and overseas. Do you not think it strange that other jurisdictions can achieve, affordable housing (which includes all the infrastructure), profitable public transport etc. with schools, parks etc., and Auckland can’t? Simply, the more you pay for land, either on the fringe or further in, the less you have to spend on the likes of infrastructure, like parks etc. and of course any $1 more is paid than is needed by a purchaser is $1 less they have for savings, children’s education etc. And your statement ”They don’t drop feed land release so much as coordinate infrastructure staging efficiently.’ is 100% not correct. It is not the most efficient or cost effective way for the majority of infrastructure. Sorry to hear that you had such an unhappy time in the suburbs, as you can only be speaking from personal experience, or cherry picking data that could apply to anyone individually in any form of housing, because the stats don’t show that to be true in general. My point is that if land was cheaper, which it can be, then it is just as easy for someone to move in as much as out. Then those who wanted to move closer in could, ie you would get a more compact city. The present cost of housing is forcing people out, and increasing sprawl. But it is the fringe that sets the price ie out going in, not in going out. You are already reaping the benefits of your ideology, ie housing becoming less affordable and the financial burden that places on families. If a compact city was the end game, then Hong Kong would be nirvana. DAS, no need to get personal. There’s ample research available into the socially and emotionally damaging effects of sprawl, and into why the places with the best psychological health of teenagers are the places where they have access to their city due to its compact form and thus their ability to access the city through walking, PT, and cycling. Also, you haven’t addressed the importance of retaining green infrastructure, and – if we’re going to have no RUB – the importance of removing the subsidies to the driving mode so that the cost of driving’s infrastructure requirements, pollution and negative social consequences can be met by the people driving, not by the rest of the population. Driving is the most expensive mode, all things considered. As a society, let’s try to reduce our costs with more efficient, more compact, more liveable cities. We don’t need economists’ myths about the need to make farmland available to make this work. Most NZ teenagers, and adults for that matter, don’t live in Auckland, or compact cities, and their mental health is just fine. Even the majority of the young people living in the CBD see it only as an interim measure on their journey through life. Poor design is across all urban forms, and there is plenty of research to show the ill effects of poor inner city design and it’s social consequences. Books like Happy City, are a good feel good read, but Bruegmann, Cheshire, Bertaud, Angel etc. are more nuts and bolts about how they need to work as a system. Plus having being involved in large scale developments both in NZ and overseas, I know the real hard cost of development, and that our present NZ methodology is full of waste, which is a cost to the purchaser but revenue to those that unnecessarily clip the ticket where they can. But the real question you need to asked is, in getting a ‘Happy City,’ which includes all of the city including the suburbs is why do you insist that people pay more for it than they have to? Auckland house prices are twice as high as they need to be. Do you not think that people would be happier if they could buy the same house for half the price. Do you not think that with the money saved, they wouldn’t like to build a better house that was more design and energy efficient? Do you not think they would use the extra money saved for kids education, health, holidays and retirement savings etc? Name one good thing about having to take on twice as much debt just for the sake of it? And I agree, let the ALL the value added costs fall to the user, let the full road transport costs fall on the user, let the full public transport costs fall on the user, all without subsidy. Ockham are building cheaper homes in places where people actually want to live, and are reducing the vkt of the residents in the process (compared to if they had moved into a house on the outskirts). Other developers are trying to do the same but from what I’ve seen, their RC’s are being delayed and prevented due to the Council Official’s NIMBY interpretations of the AUP. There is also a massive bill mounting due to the environmental and social damage that sprawl is creating. This needs to be a big part of the discussion. If you buy a newly built house, 50% of the price is indeed the price of the land. That part is not a myth. I find that quite odd. Effectively that is a 100% “land usage tax” on building your house. But also, I think the most debilitating zoning restrictions are the extremely low maximal densities in inner suburbs. -the 120-unit development as built would have had a land price of 120 x 1/2 x $615,000 = $36,900,000. That stark difference means it’s worth having a look at what else Todd has to say. Particularly about the savings to a developer – and thus to the home buyer – from not having to include all the people-unfriendly car infrastructure in the design. I think the money that is made in the rezoning is giving the big players doing the rezoning a windfall, and pushing up the prices. My solution is to stop drip feeding the land. We have the land available within the urban area. We just need to assist developers trying to do the developments that aren’t based around car dependency, instead of having a Council set on finding every excuse not to allow them. Alan Bertuads introduction to the latest Demograhia report is well worth the read. For the record, my position for less restrictive zoning is both up and out, so as to remove non value added costs from the system eg monopolistic land banking. This would make it cheaper to own anywhere, including cheaper to move closer into the center of the city. thus you could get more three bedroom family apartments rather than the many 41m2 two bedroom student boxes you are getting at present. 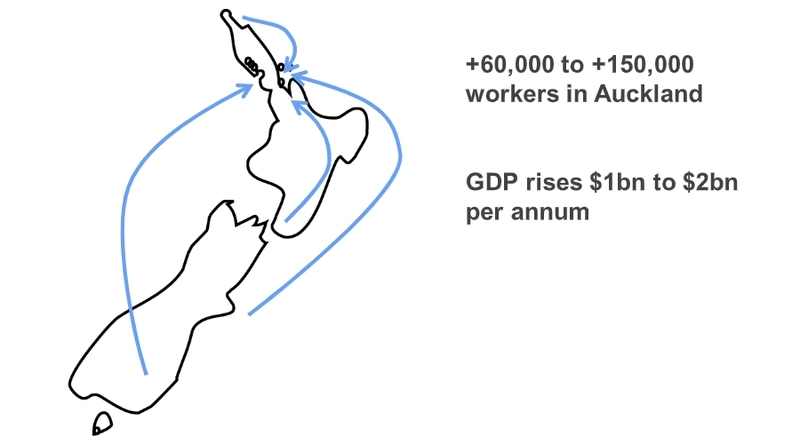 If 60,000 – 130,000 New Zealanders moved back from Australia, and that would increase our GDP $12-21 billion, what effect would that have on Australia’s GDP? Would it fall by the same amount? By less? By even more? Good question. I suspect effects on Australia are outside Peter’s model. My hunch, due to diminishing returns in agglomeration and fact Australian cities are generally larger, is that there’s likely to be a net gain in welfare from relocating kiwis back home. I’d also suggest that the welfare effects would be even larger, as most people would probably prefer to not move in the first instance. May be a case where GDP is not necessarily a good measure of welfare. Which brings me to my question for Peter: Is there a welfare component to your model? In terms of the model, welfare must surely go up since the distortion is removed, and there aren’t any wrinkles such as externalities. As for total GDP, I suspect it goes down, since productivity differences are driven by fixed differences in total factor productivity. That is, Sydney and Melbourne, are assumed to be inherently more productive than say Auckland. I think this research would have more impact on the public if it said in one statement. The model indicates if x number of kiwis hadn’t left NZ since abc date because our attractive towns and cities (the ones with good amenities, strong labour markets etc), had built more houses at lower price points we would be better off by y amount in total and z amount per capita. On McKenzie Road, Mangere, opposite Bader Drive – not the flashiest place in town – three new double storied houses have been built on a single section, all are priced close to $1 million and two have “sold” on the signs outside. Go figure, because the cost of services to those places would have been pretty minimal. 1. The rugby metaphor is overwrought! 2. To increase affordability, land prices must go up, not down. This is because residential land must be upzoned, and agricultural land must be converted to residential, to enhance supply. I suspect Geoff is thinking about lowering residential land prices by converting agricultural land. Which is like coaching the backs but not the forwards. Or something. 3. Policymakers can address speculation by addressing either the demand or the supply side. Geoff makes the case for the demand side: tax incentives. Fair enough. But one could also make the supply side case, too. Scarcity is necessary for asset bubbles (Tirole, 1985). Right now dwellings are scarce because regulations fix housing to land at a low ratio, and the land is scarce. Upzoning reduces that scarcity by increasing the ratio.